It is true that students under the voucher program are scoring lower than those who are not, but the correlation between vouchers and poor performance is certainly not generalizable, and the reason behind the scores is not really clear in the study. The authors of the study do cite differences between the schools attended by the students, but there is nothing among these factors that can explain the difference in performance. There is, however, a trend that is worth noting. 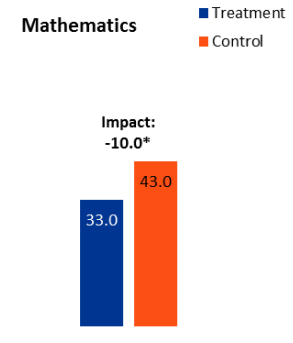 During this study, scores in mathematics are actually improving for all students in the District of Columbia. The authors of the study are thoughtful enough to remind us, "It is important to note that students in both the treatment and the control groups scored higher on the tests two years later than they did at the time of application. The impacts were negative because the gains in test scores for the treatment group were smaller than the gains in test scores for the control group. An analogy is to a footrace—all students are running forward but the control group students are running faster." With this trend in mind, one should therefore consider the fact that the control group has also experienced a change in this two-year period. When a student takes a voucher to enroll in another school, it means one less student in the struggling public school. Thus, with the vouchers, the pupil to staff ratio can be significantly lowered in the public school. Of course, lower pupil to teacher ratios can possibly mean more attention is not provided to each student. The decrease may not be gigantic, but for someone who has been teaching for decades now, near a certain threshold, having one more or one less student can be significant.